-> Customer provides one or more label design, i.e. pictures/caricatures/text, etc. -> Customer provides scroll design, i.e. pictures/caricatures/text, etc. -> Free counter display with 1st order. Additional displays $10 each. The idea of sending messages through bottles was first born in the 19th century by sailors that suffered from shipwrecks and saw no other alternative to call for help. The bottles were used to hold their messages and were thrown in the ocean in hopes someone would find them and send help. History shows that bottle messages have been found in many places through out the world. The one that took the longest to wash a shore was a bottle that had been sent in 1903, during a South Pole expedition close to Tasmania and reached the New Zealand shore in 1955. Our modern and very unique Postal Bottles on the other hand reach their destination fast and safe anywhere in the world. 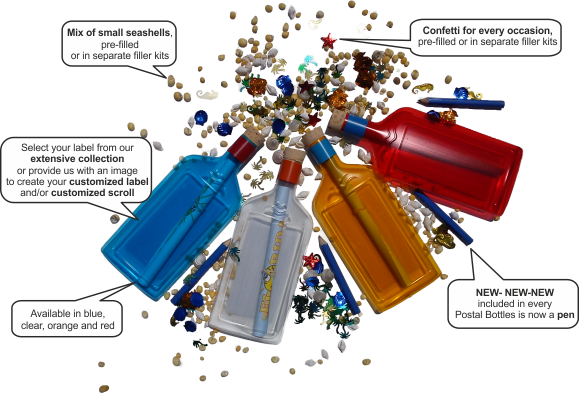 These patent pending Postal Bottles, have proudly been made in the US and carefully been assembled to give you the one of a kind product that will have everyone amazed. Postal Bottles have been designed and shaped in a way that they can easily be send through US mail, without a trip to the post office or any additional packaging. Simply drop them in a mail box and off they go. Postal Bottles come in many different colors and are made of lightweight plastic, which keeps the postage to a minimum of $1.95. The options to use Postal Bottles are endless but most importantly truly original, which makes this product fun and exciting. Stand out from the crowd and use Postal Bottles to send your next greetings or congratulations of any kind or to create the perfect love letter that will leave you loved ones longing for more. Leave a lasting impression and get the attention you are looking for when you use Postal Bottles as invitations for any special occasion. Not enough, why not use Postal Bottles as a prop for advertising and product marketing. Think of the many letters and advertisements we receive… Postal Bottles will get everyone’s attention and will have your family, friends and business partners talking about them for a long time to come.